Can two particles be in equilibrium under the action of their mutual gravitational force? Can three particles be? Can one of the three particles be? A particle will be in equilibrium when the net force acting on it is equal to zero. Two particles under the action of their mutual gravitational force will be in equilibrium when they revolve around a common point under the influence of their mutual gravitational force of attraction. In this case, the gravitational pull is used up in providing the necessary centripetal force. Hence, the net force on the particles is zero and they are in equilibrium. This is also true for a three particle system. Is there any meaning of “Weight of the earth”? Weight of a body is always because of its gravitational attraction with earth.As law of gravitational attraction is universal so it applies to any two bodies (earth and sun as well).So we can define the weight of earth w.r.t a body of mass comparable or heavier than earth because of its gravitational attraction between earth and that body. But practically no body on earth has mass comparable to earth so weight of earth will be a meaningless concept w.r.t earth frame. If heavier bodies are attracted more strongly by the earth, why don’t they fall faster than the lighter bodies? If F is the gravitational force acting on a body of mass m, then a is the acceleration of a free falling body. Here, M is the mass of the Earth; G is the universal gravitational constant and R is the radius of the Earth. a=Fm=GMR2From the above relation, we can see that acceleration produced in a body does not depend on the mass of the body. So, acceleration due to gravity is the same for all bodies. Can you think of two particles which do not exert gravitational force on each other? No. All practicals which have mass exert gravitational force on each other. Even massless particles experience the same gravitational force like other particles, because they do have relativistic mass. The earth revolves round the sun because the sun attracts the earth. The sun also attracts the moon and this force is about twice as large as the attraction of the earth on the moon. Why does the moon not revolve round the sun? Or does it? We know that the Earth-Moon system revolves around the Sun. The gravitational force of the Sun on the system provides the centripetal force its revolution. Therefore, the net force on the system is zero and the Moon does not experience any force from the Sun. This is the reason why the Moon revolves around the Earth and not around the Sun. At noon, the sun and the earth pull the objects on the earth’s surface in opposite directions. At midnight, the sun and the earth pull these objects in same direction. Is the weight of an object, as measured by a spring balance on the earth’s surface, more at midnight as compared to its weight at noon? No. Due to the revolution of the Earth around the Sun, the gravitational force of the Sun on the Earth system is almost zero. Hence, the body will not experience any force due to the Sun. Therefore, weight of the object will remain the same. An apple falls from a tree. An insect in the apple finds that the earth is falling towards it with an acceleration g. Who exerts the force needed to accelerate the earth with this acceleration g? The mutual gravitational force between the apple and the Earth is responsible for the acceleration produced in the apple falling from the tree. Although the Earth will experience the same force, it does not get attracted towards the apple because of its large mass. The insect feels that the Earth is falling towards the apple with an acceleration g because of the the relative motion. vae.Both are opposite in direction. Suppose the gravitational potential due to a small system is k/r2 at a distance r from it. What will be the gravitational field? Can you think of any such system? What happens if there were negative masses? Fgis always proportional to inverse of square of distance(experimental fact). If there were negative masses, then this type of system is possible. This system is a dipole of two masses, i.e., two masses, one positive and the other negative, separated by a small distance. r=∞to be 20 J and still use this formula? If no, what formula should be used to calculate the gravitational potential energy at separation r? This relation does not tell that the gravitational potential energy is zero at infinity. For our convenience, we choose the potential energies of the two particles to be zero when the separation between them is infinity. r=∞is 20 J, then we need to modify the formula. U(r,)=U(r)-U(∞)Given: U(∞)=20 J∴ U(r)=-Gm1m2r2-20This formula should be used to calculate the gravitational potential energy at separation r.
The weight of an object is more at the poles than at the equator. Is it beneficial to purchase goods at equator and sell them at the pole? Does it matter whether a spring balance is used or an equal-beam balance is used? The weight of an object is more at the poles than that at the equator. In purchasing or selling goods, we measure the mass of the goods. The balance used to measure the mass is calibrated according to the place to give its correct reading. So, it is not beneficial to purchase goods at the equator and sell them at the poles. A beam balance measures the mass of an object, so it can be used here. For using a spring balance, we need to calibrate it according to the place to give the correct readings. The weight of a body at the poles is greater than the weight at the equator. Is it the actual weight or the apparent weight we are talking about? Does your answer depend on whether only the earth’s rotation is taken into account or the flattening of the earth at the poles is also taken into account? The weight of a body at the poles is greater than that at the equator. Here, we are talking about the actual weight of the body at that particular place. Yes. If the rotation of the Earth is taken into account, then we are discussing the apparent weight of the body. If the radius of the earth decreases by 1% without changing its mass, will the acceleration due to gravity at the surface of the earth increase or decrease? If so, by what per cent? Here, M is the mass of Earth; R is the radius of the Earth and G is universal gravitational constant. g’=GMR’2=GM(0.99R)2⇒g’=1.02×GMR2=1.02gHence, the value of the acceleration due to gravity increases when the radius is decreased. A nut becomes loose and gets detached from a satellite revolving around the earth. Will it land on the earth? If yes, where will it land? If no, how can an astronaut make it land on the earth? No, it will not land on the Earth. The nut will start revolving in the orbit of the satellite with the same orbital speed as that of the satellite due to inertia of motion. An astronaut can make it land on the Earth by projecting it with some velocity toward the Earth. Is it necessary for the plane of the orbit of a satellite to pass through the centre of the earth? According to Kepler first law of planetary motion all planets move in elliptical orbits with sun at one of its foci. It applies to any planet and its satellite as well.This implies that plane of the satellite has to pass through the centre of planet (earth). Consider earth satellites in circular orbits. A geostationary satellite must be at a height of about 36000 km from the earth’s surface. Will any satellite moving at this height be a geostationary satellite? Will any satellite moving at this height have a time period of 24 hours? T=(gR2T24π2)13-RT=4π2(h+R)3gR2=4×3.142×(36000+6400)3×1099.8×(6400×103)2=24.097 HrWhich implies that it is a geostationary sattelite with time period=24 Hrs. No part of India is situated on the equator. Is it possible to have a geostationary satellite which always remains over New Delhi? No. All geostationary orbits are concentric with the equator of the Earth. As the earth rotates about its axis, a person living in his house at the equator goes in a circular orbit of radius equal to the radius of the earth. Why does he/she not feel weightless as a satellite passenger does? A person living in a house at the equator will not feel weightlessness because he is not in a free fall motion. Satellites are in free fall motion under the gravitational pull of the earth, but, due to the curved surface of the Earth, they move in a circular path. The gravitational force on the satellite due to the Sun provides the centripetal force for its revolution. Therefore, net force on the satellite is zero and, thus, a person feels weightless in a satellite orbiting the earth. Two satellites going in equatorial plane have almost same radii. As seen from the earth one moves from east one to west and the other from west to east. Will they have the same time period as seen from the earth? If not which one will have less time period? No, both satellites will have different time periods as seen from the Earth. The satellite moving opposite (east to west) to the rotational direction of the Earth will have less time period, because its relative speed with respect to the Earth is more. A spacecraft consumes more fuel in going from the earth to the moon than it takes for a return trip. Comment on this statement. Yes, a spacecraft consumes more fuel in going from the Earth to the Moon than it takes for the return trip. In going from the Earth to the Moon, the spacecraft has to overcome the gravitational pull of the earth. So, more fuel is consumed in going from the Earth to Moon. However, in the return trip, this gravitation pull helps the spacecraft to come back to the Earth. We know that the distance of the Moon from the Earth is about 60 times the radius of the earth. So, acceleration due to gravity at that distance is 0.0027 m/s2. When the Moon is stopped for an instant and then released, it will fall towards the Earth with an initial acceleration of 0.0027 m/s2. Rm=Re4=64000004=1600000 mSo, when the Moon is just about to hit the surface of the Earth, its centre of mass is at a distance of (Re + Rm) from the centre of the Earth. Suppose, the acceleration due to gravity at the earth’s surface is 10 m s−2 and at the surface of Mars it is 4⋅0 m s−2. A 60 kg passenger goes from the earth to the Mars in a spaceship moving with a constant velocity. Neglect all other objects in the sky. Which part of figure (11-Q1) best represents the weight (net gravitational force) of the passenger as a function of time? At one point between the Earth and Mars, the gravitational field intensity is zero. So, at that point, the weight of the passenger is zero. The curve C indicates that the weight of the passenger is zero at a point between the Earth and Mars. (d) 21/3 W at the planet. Here, m is the actual mass of the object; Me is the mass of the earth and Re is the radius of the earth. Let Rp be the radius of the planet. The work done by the person is equal to the kinetic energy and the potential energy of the mass of 1 kg at point A. Let VA be the potential at point A. (A) The plot of V against r is discontinuous. (B) The plot of E against r is discontinuous. The plot of E against r is discontinuous as gravitational field inside the spherical shell is zero (r < R). The plot of V against r is a continuous curve for a uniform spherical shell. Both the plots (i.e., V against r and E against r) are continuous curves for a uniform solid sphere. (A) There are points outside the earth where the value of g is equal to its value at the equator. (B) There are points outside the earth where the value of g is equal to its value at the poles. So, there are points above both the poles where the value of g is equal to its value at the equator. Two spherical balls of mass 10 kg each are placed 10 cm apart. Find the gravitational force of attraction between them. Four particles having masses m, 2m, 3m and 4m are placed at the four corners of a square of edge a. Find the gravitational force acting on a particle of mass m placed at the centre. The time period of an earth-satellite in circular orbit is independent of the mass of the satellite, but depends on the radius of the orbit. The magnitude of gravitational potential energy of the moon-earth system is U with zero potential energy at infinite separation. The kinetic energy of the moon with respect to the earth is K.
For a system to be bound , total energy of the system should be negative.As we know that kinetic energy can never be negative. (d) insufficient information to deduce the relation between t1 and t2. Kepler’s second law states that the line joining a planet to the Sun sweeps out equal areas in equal intervals of time, i.e., areal velocity of a planet about the Sun is constant. (d) the person in satellite is not accelerated. The gravitational pull on the satellite is used up in providing the necessary centripetal force required for its revolution around the earth. This means that there is no net force on the person sitting in a chair in the satellite. So, the normal reaction of the chair on the person is zero and he will feel weightless. A body is suspended from a spring balance kept in a satellite. The reading of the balance is W1 when the satellite goes in an orbit of radius R and is W2 when it goes in an orbit of radius 2 −R. The gravitational pull on the satellite in both cases is used up in providing the necessary centripetal force required for its revolution around the earth. This means that there is no net force acting on the body which has been suspended from a spring balance in the satellite. So, the readings of the spring balance in both the cases are the same and is equal to zero. mgRThe kinetic energy needed to project a body of mass m from the Earth’s surface to infinity is equal to the negative of the change in potential energy of the body. Here, M is the mass of the earth; R is the radius of the earth and m is the mass of the body. Let the particle be projected with speed v so that it just escapes the gravitational pull of the earth. νe(d) will depend on the direction of projection. (d) will depend on the direction of projection.For example a body projected vertically requires less escape velocity than a body projected at an angle with the vertical. All the given conditions for gravitational potential and gravitational field at a point are possible. Inside a uniform spherical shell, the gravitational field is the same everywhere and is equal to zero. The gravitational potential has a constant value inside a uniform spherical shell. AS it is maintaining its shape so its mass will remain constant which implies that if it shrinks then its volume decreases and to keep the mass constant ,its density increases.Also the gravitational potential at the centre of a uniform spherical shell is inversely proportional to the radius of the shell with a negative sign. When a uniform spherical shell gradually shrinks, the gravitational potential at the centre decreases (because of the negative sign in the formula of potential). 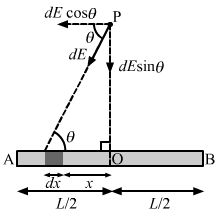 (d) is zero in no part of the motion. When a planet is moving in an elliptical orbit, at some point, the line joining the centre of the Sun and the planet is perpendicular to the velocity of the planet. For that instant, work done by the gravitational force on the planet becomes zero. As there is no net increase in the speed of the planet after one complete revolution about the Sun, the work done by the gravitational force on the planet in one complete revolution is zero. Note:For elliptical orbits angle between force ans velocity is always 90 so there the work done is zero in any small part of the orbit. Two satellites A and B move round the earth in the same orbit. The mass of B is twice the mass of A. (a) Speeds of A and B are equal. (b) The potential energy of earth+A is same as that of earth+B. (c) The kinetic energy of A and B are equal. (d) The total energy of earth+A is same as that of earth+B. The orbital speed of a satellite is independent of the mass of the satellite, but it depends on the radius of the orbit. Potential energy, kinetic energy and total energy depend on the mass of the the satellite. Which of the following quantities remain constant in a planetary motion (consider elliptical orbits) as seen from the sun? In planetary motion, the net external torque on the planet is zero. Therefore, angular momentum will remain constant. Three equal masses m are placed at the three corners of an equilateral triangle of side a. Find the force exerted by this system on another particle of mass m placed at (a) the mid-point of a side, (b) at the centre of the triangle. Consider that mass ‘m‘ is placed at the midpoint O of side AB of equilateral triangle ABC. All the forces are equal in magnitude but their directions are different as shown in the figure. Equal and opposite forces along OM and ON cancel each other. Three uniform spheres each having a mass M and radius a are kept in such a way that each touches the other two. Find the magnitude of the gravitational force on any of the spheres due to the other two. Three spheres are placed with their centres at A, B and C as shown in the figure. 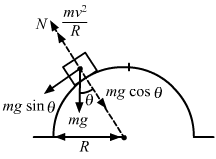 Four particles of equal masses M move along a circle of radius R under the action of their mutual gravitational attraction. Find the speed of each particle. Assume that three particles are at points A, B and C on the circumference of a circle. Let v be the velocity with which the particle is moving. Find the acceleration due to gravity of the moon at a point 1000 km above the moon’s surface. The mass of the moon is 7.4 × 1022 kg and its radius is 1740 km. where M is the mass of the moon; r is the distance of point from the centre of the moon and G is universal gravitational constant. Two small bodies of masses 10 kg and 20 kg are kept a distance 1.0 m apart and released. Assuming that only mutual gravitational forces are acting, find the speeds of the particles when the separation decreases to 0.5 m.
Consider a system of two bodies. The initial linear momentum of the system is zero as the bodies were initially at rest when they were released. Since the gravitational force is an internal force and the net external force on the system is zero, so by the law of conservation of linear momentum, the final momentum of the system will also be zero. A semicircular wire has a length L and mass M. A particle of mass m is placed at the centre of the circle. Find the gravitational attraction on the particle due to the wire. Consider a small mass element of length dl subtending dθ angle at the centre. In the semicircle, we can consider a small element dθ. dF=GmR2dm=GMRmLR2dθThe symmetric components along AB cancel each other. Derive an expression for the gravitational field due to a uniform rod of length L and mass M at a point on its perpendicular bisector at a distance d from the centre. Consider a small mass element of length dx at a distance x from the centre of the rod. dE=Gdm×1d2+x2The components of the gravitational field due to the symmetrical mass element along the length of the rod cancel each other. Two concentric spherical shells have masses M1, M2 and radii R1, R2 (R1 < R2). What is the force exerted by this system on a particle of mass m1 if it is placed at a distance (R1 + R2)/2 from the centre? R1+R22as shown in the figure. The gravitational force of m due to the shell of M2 is zero, because the mass is inside the shell. A tunnel is dug along a diameter of the earth. Find the force on a particle of mass m placed in the tunnel at a distance x from the centre. A tunnel is dug along a chord of the earth at a perpendicular distance R/2 from the earth’s centre. The wall of the tunnel may be assumed to be frictionless. Find the force exerted by the wall on a particle of mass m when it is at a distance x from the centre of the tunnel. Let d be distance of the particle from the centre of the Earth. Now, d2=x2+R24=4×2+R24⇒d=124×2+R2Let M be the mass of the Earth and M‘ be the mass of the sphere of radius d.
A solid sphere of mass m and radius r is placed inside a hollow thin spherical shell of mass M and radius R as shown in figure (11−E1). 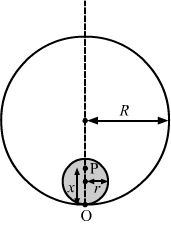 A particle of mass m‘ is placed on the line joining the two centres at a distance x from the point of contact of the sphere and the shell. Find the magnitude of the resultant gravitational force on this particle due to the sphere and the shell if (a) r < x < 2r, (b) 2r < x < 2R and (c) x > 2R. (a) Consider that the particle is placed at a distance x from O.
F=Gm’ dm(x-r)2 =Gm(x-r)3r3m'(x-r)2=Gmm'(x-r)r3Force on the particle due to the shell will be zero because gravitational field intensity inside a shell is zero. Force on the body due to the shell will again be zero as particle is still inside the shell. then F is only due to the solid sphere. ∴F=Gmm’x-r2(c) If x > 2R, then the gravitational force is due to both the sphere and the shell. =Gmm’x-r2As both the forces are acting along the same line joining the particle with the centre of the sphere and shell so both the forces can be added directly without worrying about their vector nature. A thin spherical shell having uniform density is cut in two parts by a plane and kept separated as shown in figure (11−E3). The point A is the centre of the plane section of the first part and B is the centre of the plane section of the second part. Show that the gravitational field at A due to the first part is equal in magnitude to the gravitational field at B due to the second part. We know that in a thin spherical shell of uniform density, the gravitational field at its internal point is zero. So, at points A and B, the gravitational fields are equal and opposite and, thus, cancel each other. So the net field is zero. Two small bodies of masses 2.00 kg and 4.00 kg are kept at rest at a separation of 2.0 m. Where should a particle of mass 0.10 kg be placed to experience no net gravitational force from these bodies? The particle is placed at this point. What is the gravitational potential energy of the system of three particles with usual reference level? Let the mass of 0.10 kg be at a distance x from the 2 kg mass and at a distance of (2 − x) from the 4 kg mass. Three particles of mass m each are placed at the three corners of an equilateral triangle of side a. Find the work which should be done on this system to increase the sides of the triangle to 2a. The work done in increasing the side of the triangle from a to 2a is equal to the difference of the potential energies of the system. A particle of mass 100 g is kept on the surface of a uniform sphere of mass 10 kg and radius 10 cm. Find the work to be done against the gravitational force between them to take the particle away from the sphere. the difference between the potential energy of the particle at infinity and potential energy of the particle at the surface of the sphere. E→=5 N kg-1 i→+12 N kg-1 j→. (a) Find the magnitude of the gravitational force acting on a particle of mass 2 kg placed at the origin. (b) Find the potential at the points (12 m, 0) and (0, 5 m) if the potential at the origin is taken to be zero. (c) Find the change in gravitational potential energy if a particle of mass 2 kg is taken from the origin to the point (12 m, 5 m). (d) Find the change in potential energy if the particle is taken from (12 m, 0) to (0, 5 m). i→, j→, k→. (c) Calculate the magnitude of the gravitational force on a particle of mass 500 g placed at the origin. E=2i→+3j→ N kg-1. Show that no work is done by the gravitational field when a particle is moved on the line 3y + 2x = 5.
m1=tan θ1=32The given line is 3y + 2x = 5. Since the directions of the field and the displacement are perpendicular to earth other, no work is done by the gravitational field when a particle is moved on the given line. Find the height over the Earth’s surface at which the weight of a body becomes half of its value at the surface. Assume that at height h, the weight of the body becomes half. What is the acceleration due to gravity on the top of Mount Everest? Mount Everest is the highest mountain peak of the world at the height of 8848 m. The value at sea level is 9.80 m s−2. Let g’ be the acceleration due to gravity on Mount Everest. Then g’=g1-2hRhere h=8848 m =9.81-0.00276 =9.00.99724 =9.77 m/s2∴ The acceleration due to gravity on the top of Mount Everest is 9.77 m/s2. Find the acceleration due to gravity in a mine of depth 640 m if the value at the surface is 9.800 m s−2. The radius of the earth is 6400 km. Let g‘ be the acceleration due to gravity in a mine of depth d.
A body is weighed by a spring balance to be 1.000 kg at the North Pole. How much will it weigh at the equator? Account for the earth’s rotation only. Let gp be the acceleration due to gravity at the poles. Let ge be the acceleration due to gravity at the equator. ∴ The body will weigh 9.776 N at the equator. A body stretches a spring by a particular length at the earth’s surface at the equator. At what height above the south pole will it stretch the same spring by the same length? Assume the earth to be spherical. Let h be the height above the South Pole where the body stretch the spring by the same length. ∴g-ω2r=g1-2hR⇒1-ω2R2g=1-2hR⇒h=ω2R22g =7.3×10-52×6400×10-322×9.81 =7.32×64219.62 =11125 m = 10 km approx. At what rate should the earth rotate so that the apparent g at the equator becomes zero? What will be the length of the day in this situation? The apparent acceleration due to gravity at the equator becomes zero. A pendulum having a bob of mass m is hanging in a ship sailing along the equator from east to west. When the ship is stationary with respect to water the tension in the string is T0. (a) Find the speed of the ship due to rotation of the earth about its axis. (b) Find the difference between T0 and the earth’s attraction on the bob. (c) If the ship sails at speed v, what is the tension in the string? Angular speed of earth’s rotation is ω and radius of the earth is R.
(a) Speed of the ship due to rotation of the Earth is v = ωR, where R is the radius of the Earth and ω is its angular speed. (c) Let the ship move with a speed v.
The time taken by Mars to revolve round the Sun is 1.88 years. Find the ratio of average distance between Mars and the sun to that between the earth and the sun. According to Kepler’s laws of planetary motion, the time period of revolution of a planet about the Sun is directly proportional to the cube of the distance between their centres. The moon takes about 27.3 days to revolve round the earth in a nearly circular orbit of radius 3.84 × 105 km/ Calculate the mass of the earth from these data. where r is the distance between the centres of the Earth and Moon and m is the mass of the Earth. Now, 27.3=2×3.143.84×10536.67×10-11M⇒ 27.3×27.3=2×3.14×3.84×10536.67×10-11 M⇒ M=2×3.142×3.843×10153.335×10-11×27.32 =6.02×1024 kg∴ The mass of the Earth is found to be 6.02 × 1024 kg. A Mars satellite moving in an orbit of radius 9.4 × 103 km takes 27540 s to complete one revolution. Calculate the mass of Mars. where M is the mass of the Mars and r is the distance of the satellite from the centre of the planet. A satellite of mass 1000 kg is supposed to orbit the earth at a height of 2000 km above the earth’s surface. Find (a) its speed in the orbit, (b) is kinetic energy, (c) the potential energy of the earth-satellite system and (d) its time period. Mass of the earth = 6 × 1024 kg. (a) Find the radius of the circular orbit of a satellite moving with an angular speed equal to the angular speed of earth’s rotation. (b) If the satellite is directly above the North Pole at some instant, find the time it takes to come over the equatorial plane. Mass of the earth = 6 × 1024 kg. (a) The angular speed of the Earth and the satellite will be the same. What is the true weight of an object in a geostationary satellite that weighed exactly 10.0 N at the north pole? The radius of a planet is R1 and a satellite revolves round it in a circle of radius R2. The time period of revolution is T. Find the acceleration due to the gravitation of the planet at its surface. T=2πR22gR12, where g is the acceleration due to gravity at the surface of the planet. Find the minimum colatitude which can directly receive a signal from a geostationary satellite. Consider that B is the position of the geostationary satellite. ϕis the latitude and θ is the colatitude of a place which can directly receive a signal from a geostationary satellite. A particle is fired vertically upward from earth’s surface and it goes up to a maximum height of 6400 km. Find the initial speed of particle. The particle attained a maximum height 6400 km, which is equal to the radius of the Earth. A particle is fired vertically upward with a speed of 15 km s−1. With what speed will it move in interstellar space. Assume only earth’s gravitational field. Let its speed be v’ in interstellar space. A mass of 6 × 1024 kg (equal to the mass of the earth) is to be compressed in a sphere in such a way that the escape velocity from its surface is 3 × 108 m s−1. What should be the radius of the sphere?